Wow. 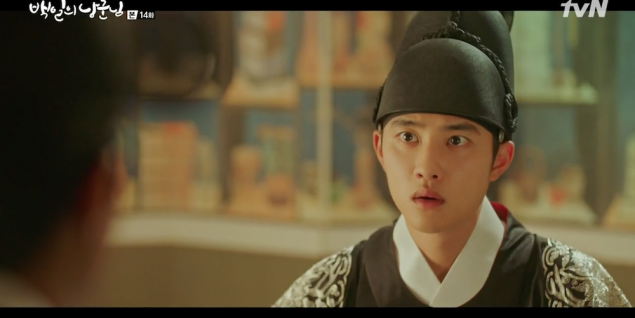 A LOT of heavy plot and emotional turmoil hit us in episode 14 of '100 Days My Prince', so please understand that I will be skipping most of the episode-summary and plot-summary; I will be jumping right to some of the big developments! As Moo Yeon comes back and grasps So Hye's wrist like real manly man (Are you watching, Yool? This is how it's DONE! 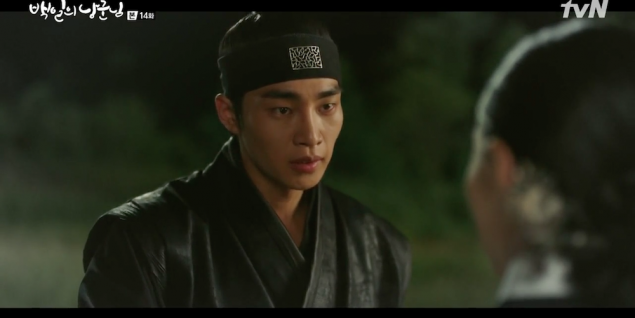 ), and then tells her that he's still willing to run away from all of this ugly mess with her (So angst! ), So Hye cracks what might be the tiniest smile! (Below.) The first trace of a real smile that we've ever seen from her in this entire series TT3TT. Something about the romance that these two have, how it's been built up little by little, it feels more heart-wrenching and tear-jerking than the romance between our leads Lee Yool (played by EXO's D.O.) and Yoon Yi Seo (played by Nam Ji Hyun). But I don't think this has anything necessarily to do with the way the main couple's story was portrayed, and it definitely doesn't have anything to do with the acting performances of D.O. and Nam Ji Hyun. I guess from a personal perspective, the tragic situation in which Moo Yeon and So Hye met, and how they still managed to develop romantic feelings despite the odds, spoke to me in a more mature sense. Show us your pretty smile! Okay but back in the capital city, guys, So Hye's father a.k.a our most evil antagonist Kim Cha Un is planning a whole, freaking, revolt, as I speak. In the last episode, he dropped the word "revolt" during his meeting with the foreign ambassador. He's now used it again, in front of his daughter. We don't know exactly what this "revolt" means yet - Does he plan on overthrowing the current King for another King AGAIN, like he did when Yool was a child? Whatever he's planning, it sounds bloody, and it sounds bad. But the good news is, that our second male lead Jung Jae Yoon has now returned to the good side. He has taken on yet another new title - I think something along the lines of the crown prince's right-hand advisor? Oh, who knew big arm hearts existed in the Joseon era, too? And even the little finger heart! I have to apologize and admit my mistake here, because I was honestly very wrong about Jae Yoon's character. 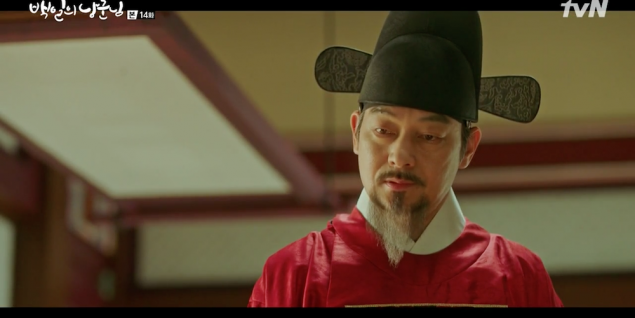 In the previous few episodes, I was constantly on the fence about whether or not Jae Yoon was a really worthwhile character, questioning if he was just there as a pretty, funny second male lead to look at, and also questioning his loyalty to the crown prince. It turns out, Jae Yoon's character was a much deeper, much more progressive character than I'd realized. I realized this while watching Jae Yoon's conversation with his courtesan informant. 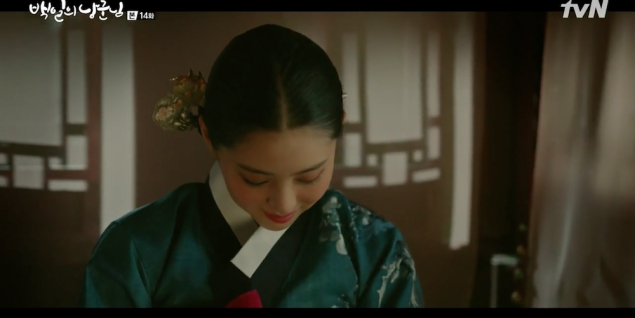 So we knew from early on that Jae Yoon was born from a concubine into an aristocrat family, and so he's been treated like an outsider by the aristocrats around him all his life. As much, Jae Yoon's character is actually a character who has been constantly questioning the "system", and his place within it. A smart man, Jae Yoon is a radical when it comes to the structure of social hierarchy, the discrimination of the rich from the poor, the system of power and politics. But not in a very vengeful, twisted way. He has a great personality and is always looking up with a smile, questioning how to live by his own rules, with his own decisions, finding happiness with his own hands, rather than succumbing to the unfair "system". You were on my side the whole time? Yes, dude. Just look at my face. How could I be one of the bad guys? I feel bad for not realizing the true worth of Jae Yoon's character up until now, but at the same time, I think some of the gray area that he showed us in the past episodes, pretending to be Kim Cha Un's "dog", also made this revelation much more dramatic and moving. 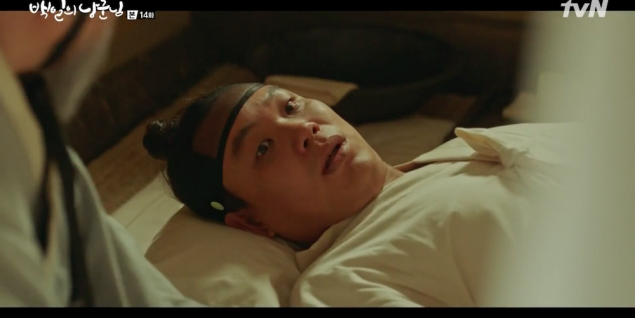 I can now finally rely on Jae Yoon as one of the key figures who will help Yool and Hong Shim in whatever it is that they have to do to STOP Kim Cha Un, and this is definitely reassuring as we head into the final two episodes next week. 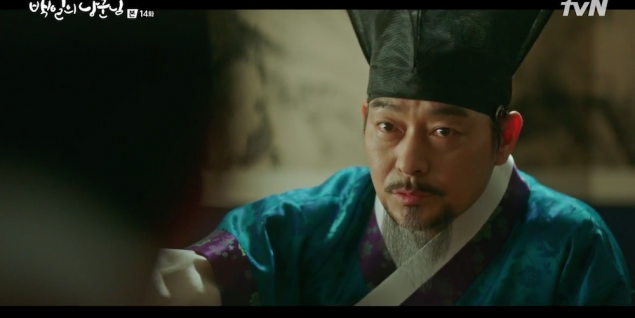 Another very commendable thing that Jae Yoon did in this episode - he reunited our crown prince Lee Yool with his closest royal servant! OMFG I wake up and EXO's D.O. is standing by my bedside?!?!?! I LOVE YOU I LOVE YOU I LOVE YOU!!!!!! Learning that the figure who attempted to murder the crown prince's last surviving royal servant was Kim Cha Un, Yool slowly begin to piece together the fact that Kim Cha Un is the enemy. Thanks to the help of the servant - nursed back to life despite having his throat sliced open with a freaking knife, btw - Yool is able to get ahold of his diary from before his death! 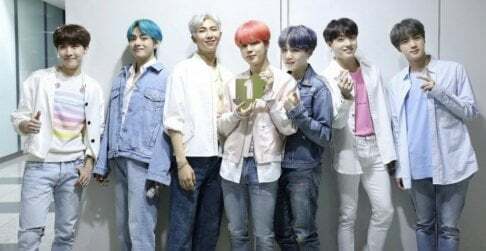 What does this mean?? 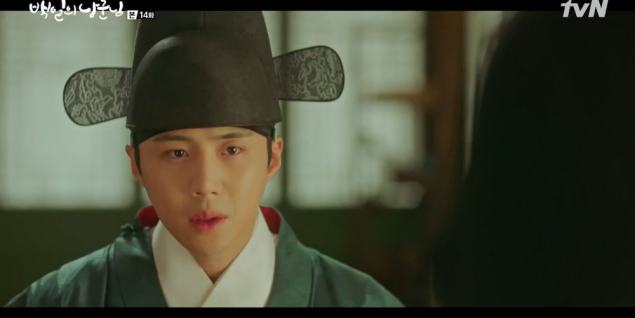 Our crown prince officially has his MEMORIES BACK!!!! 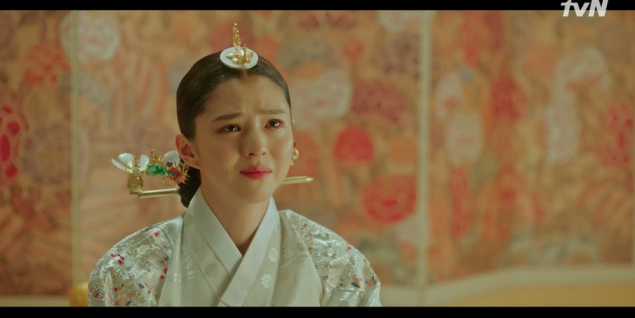 Unfortunately, Yool gaining his memories back and promising Hong Shim/Yi Seo that he will come back for her somehow, also means bad news for our princess consort, Kim So Hye. Because her secret is now out - the baby in her womb is not Yool's blood. 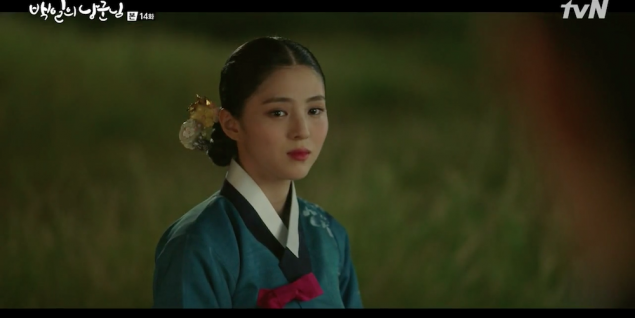 It's interesting how we were all sort of made to believe in the beginning of the drama that the princess consort So Hye was an antagonist - she's Kim Cha Un's daughter after all, plus she seemed like she had some bad plans of her own. Kim Cha Un coldly shows up in So Hye's room and tells her that no, she is forbidden from running away with Moo Yeon, if she wants to keep Moo Yeon alive. There's no point in trying to reach for a happy ending, because in the end, she's his daughter. Those are the cold, merciless words a father has toward his daughter, when he learns that his daughter is in love with his former servant. And in distress, So Hye claims, "I hate the fact that I was born as your daughter." Plus another huge issue to note - even when his daughter asks him how far he must go and how many more people he must kill/hurt, Kim Cha Un answers that he doesn't know. Will Kim Cha Un get away with another revolt in the end? What's going to happen to all of our star-crossed lovers - Yool, Yi Seo, So Hye, Moo Yeon, and Jae Yoon? Will anyone be able to have a happily ever after with the person they truly love in the end? With only two more episodes left before the end, '100 Days My Prince' is really cutting it close here! But one thing I can say for sure is that episode 14 might have been my favorite episode so far. I experienced a lot of emotional turmoil while watching, particularly when involving So Hye and Moo Yeon, and I think I can safely say that I'm willing to give episode 14 a near perfect score. I really hope this good score streak continues until the finale. this is one extremely well made drama.. i guess since its pre-produced they didnt extend the number of episodes or changed the story-line according to the rating..
i totally ship crown princess and hong shim's brother.. the lead's romance is very cute and adorable but crown princess's love story is more dark.. both of them are grey characters and dont want to do things they have done..